Sancha of Castile (21 September 1154/5 – 9 November 1208) was the only surviving child of King Alfonso VII of Castile by his second wife, Richeza of Poland. On January 18, 1174, she married King Alfonso II of Aragon at Zaragoza; they had at least eight children who survived into adulthood. A patroness of troubadours such as Giraud de Calanson and Peire Raymond, the queen became involved in a legal dispute with her husband concerning properties which formed part of her dower estates. In 1177 she entered the county of Ribagorza and took forcible possession of various castles and fortresses which had belonged to the crown there. After her husband died at Perpignan in 1196, Sancha was relegated to the background of political affairs by her son Peter II. She retired from court, withdrawing to the Hospitaller convent for noble ladies, the Monastery of Santa María de Sigena, at Sigena, which she had founded. There she assumed the cross of the Order of St John of Jerusalem which she wore until the end of her life. The queen mother entertained her widowed daughter Constance at Sigena prior to her leaving Aragon to marry Emperor Frederick II in 1208. She died soon afterwards, aged fifty-four, and was interred in front of the high altar of her foundation at the Monastery of Santa María de Sigena; her tomb is still there to be seen. Constance (1179 – 23 June 1222), married firstly King Imre of Hungary and secondly Frederick II, Holy Roman Emperor. Eleanor (1182 – February 1226), married Count Raymond VI of Toulouse. ^ Martin 2012, p. 1087. ^ Doran & Smith 2008, p. 88. ^ Kedar, Phillips & Riley-Smith 2005, p. 15. ^ Luscombe & Riley-Smith 2004, p. 759. Doran, John; Smith, Damian J. (2008). Pope Celestine III (1191-1198): Diplomat and Pastor. Ashgate. Kedar, Benjamin Z.; Phillips, Jonathan; Riley-Smith, Jonathan, eds. (2005). Crusades. Vol. 4. Ashgate Publishing. Luscombe, David; Riley-Smith, Jonathan, eds. (2004). The New Cambridge Medieval History, C.1024-c.1198. Vol. IV. Cambridge University Press. Martin, Therese, ed. (2012). Reassessing the Roles of Women as 'Makers' of Medieval Art and Architecture. Brill. Pope Celestine III, born Giacinto Bobone, reigned from 30 March or 10 April 1191 to his death in 1198. He was born into the noble Orsini family in Rome and served as a cardinal-deacon prior to becoming pope. He was ordained as a priest on 13 April 1191 and he ruled the church for six years, nine months, and nine days before he died aged 92. He was buried at the Lateran. Peter II the Catholic was the King of Aragon and Count of Barcelona from 1196 to 1213. Alfonso II, called the Chaste or the Troubadour, was the King of Aragon and, as Alfons I, the Count of Barcelona from 1164 until his death. The eldest son of Count Ramon Berenguer IV of Barcelona and Queen Petronilla of Aragon, he was the first King of Aragon who was also Count of Barcelona. He was also Count of Provence, which he conquered from Douce II, from 1166 until 1173, when he ceded it to his brother, Ramon Berenguer III. His reign has been characterised by nationalistic and nostalgic Catalan historians, as l'engrandiment occitànic or "the Pyrenean unity": a great scheme to unite various lands on both sides of the Pyrenees under the rule of the House of Barcelona. Alfonso VII, called the Emperor, became the King of Galicia in 1111 and King of León and Castile in 1126. Alfonso, born Alfonso Raimúndez, first used the title Emperor of All Spain, alongside his mother Urraca, once she vested him with the direct rule of Toledo in 1116. Alfonso later held another investiture in 1135 in a grand ceremony reasserting his claims to the imperial title. He was the son of Urraca of León and Raymond of Burgundy, the first of the House of Ivrea to rule in the Iberian peninsula. Constance of Burgundy was the daughter of Duke Robert I of Burgundy and Helie de Semur-en-Brionnais. She was Queen consort of Castile and León by her marriage to Alfonso VI of León and Castile. She was the granddaughter of King Robert II of France, the second monarch of the French Capetian dynasty. She was the mother of Urraca of León, who succeeded her father in both Castile and León. Ramon Berenguer IV, sometimes called the Saint, was the Count of Barcelona who brought about the union of his County of Barcelona with the Kingdom of Aragon to form the Crown of Aragon. Theresa was Countess and Queen of Portugal. She rebelled against vassalic ties with her half-sister Urraca and was recognised as Queen by Pope Paschal II in 1116. After being captured she was forced to accept Portugal's vassalage to the Kingdom of León in 1121, although she was allowed to keep her royal title. Her political and amorous affairs with Galician nobleman Fernando Pérez de Traba led to her ouster by her son, Afonso Henriques, who with the support of the Portuguese nobility and clergy defeated her at the Battle of São Mamede in 1128. Odo I, also known as Eudes, surnamed Borel and called the Red, was Duke of Burgundy between 1079 and 1103. Odo was the second son of Henry of Burgundy and grandson of Robert I. He became the duke following the abdication of his older brother, Hugh I, who retired to become a Benedictine monk at Cluny. 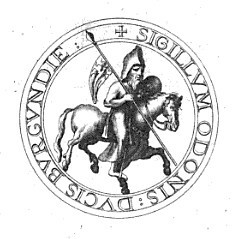 Raymond VI was Count of Toulouse and Marquis of Provence from 1194 to 1222. He was also Count of Melgueil from 1173 to 1190. García Ramírez, sometimes García IV, V, VI or VII, called the Restorer, was the King of Navarre (Pamplona) from 1134. The election of García Ramírez restored the independence of the Basque kingdom after 58 years of political union with the Kingdom of Aragon. After some initial conflict he would align himself with king Alfonso VII of León and Castile, and as his ally take part in the Reconquista. Violant of Hungary was a Queen consort of Aragon and the second wife of King James I of Aragon. She is also called Jolán in Hungarian, Iolanda or Violant d'Hongria in Catalan and Yolanda or Violante de Hungría in Spanish. Dulce of Aragon was Queen consort to King Sancho I of Portugal. As the eldest daughter of Ramon Berenguer IV, Count of Barcelona and his wife, Queen Petronila of Aragon, she was the sister of the future King Alfonso II of Aragon. Sibylla di Aquino, of Acerra (1153–1205) was Queen of Sicily as the wife of King Tancred. She was regent in 1194 for their son, King William III. She was the sister of Count Richard of Acerra. Royal Monastery of Santa María de Sigena is a convent in Villanueva de Sigena, region of Aragon, Spain. Built between 1183 and 1208, the Romanesque church was founded by Queen Sancha of Castile, wife of Alfonso II of Aragon.